The best way to get to know a community is by scheduling a tour. See the facilities, meet the staff and residents, and get a feel first hand what it's like to live at Sugar Creek Assisted Living. To us at Sugar Creek in Troy, Missouri, assisted living means two things: you do the living and we help you live. Our personal assistants provide what you need when you need it. Here, the emphasis is less on paperwork and more on people. Our licensed nurse and certified medication aides get to know our residents like family, with all of their unique needs and preferences. It's like home. 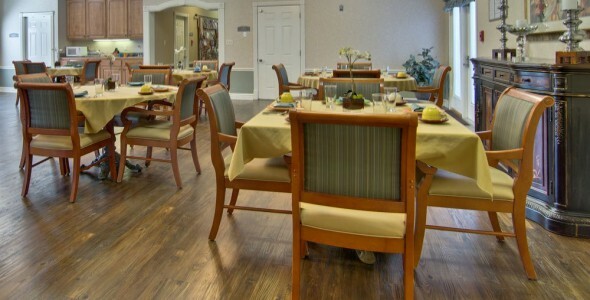 Dining is a focal point of our residents' day at Sugar Creek. It starts with an open breakfast with eggs just the way you like them. We accommodate our early risers ready for toast and coffee as well as those who can't start the day without a big hot breakfast. Comfort foods, foods familiar and favorite, are part of our menu. Our admission counseling services are comprehensive. Our administrator helps guide the family through all of the care options available to them as well as through the maze of paperwork involved with accessing our public long term care benefits. Making it easy on the family is our first priority at Sugar Creek. The Arbors of Sugar Creek is an 18 room memory care community offering a secure and safe home like environment. Residents can choose a private or shared accommodations and enjoy activities in our lovely, secure courtyard. Trained staff provide individual care for each person's special needs. With low staff to resident ratio our specialized services are unique to dementia care providing residents with dignity and peace of mind for our families.